Harald Roy Andersen is attached to the elite bomber crews of No. 156 Squadron, Pathfinder force, when his Lancaster is shot down by flak in the air over France in 1943, only 21 years old. Harald Roy Andersen is born on 16 October 1921. He is the son of Jacob Harald Andersen and Ethel Louisa Andersen, of East Challow, Wantage. He volunteers for the Royal Air Force during the Second World War and is trained as pilot. On 7 March 1943, he is appointed Pilot Officer. He is then posted at No. 156 Squadron. A little more than a month later, he is killed in action. The grave of Harald Roy Andersen at the cemetery in Brimont, Marne, France, Source: The collection of Mr. Olivier Housseaux. On 16/17 April 1943, he is on a raid in Lancaster B. Mk. I ('GT-D' W4854) targeting the Skoda factories in Pilsen. On the return, the aircraft is hit by flak over Brimont, Marne, France. Harald Roy Andersen and the rest of the crew is killed. 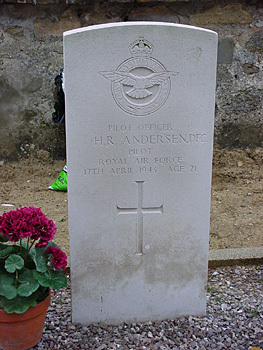 Harold Roy Andersen is commemorated at the Brimont Churchyard in Marne, France (London Gazette; www.cwgc.org; olivier.housseaux.free.fr).